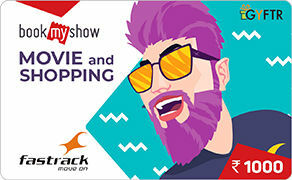 This E-Gift voucher is redeemable for products only at the specified Retail format (Fastrack). This E-Voucher cannot be used for the purchase of Nebula Brand or Solid gold Watches. The cash amount value loaded on the E-voucher shall be valid for 180 days from the date of issue. If E-Voucher No & pin is lost or stolen, it will not be issued again. E-Voucher will be applicable on any offers running in the stores at the time of purchase. Multiple Gift vouchers (Maximum- 3) can be clubbed for a single purchase. E-Gift voucher to be used for one-time purchase only and any balance amount is non-refundable.